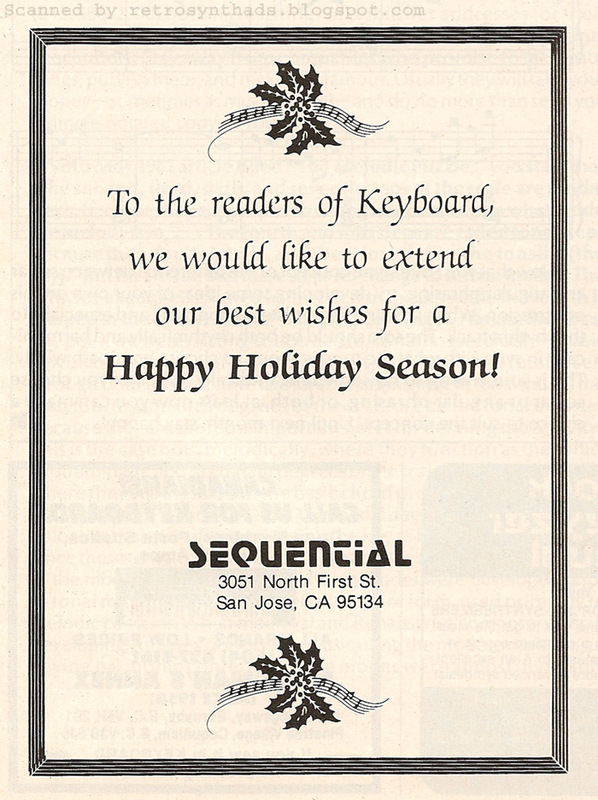 Sequential "Happy Holiday Season" quarter page advertisement from page 85 in Keyboard Magazine December 1984. I've been yapping recently about how rare company 'holiday-themed' ads are. 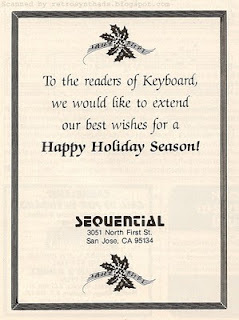 My last blog post was about an Oberheim holiday ad that still managed to keep their products front and centre, but this ad from Sequential is even more special to me. Because it doesn't even mention a product. And because I get to see Sequential's cool logo/font. 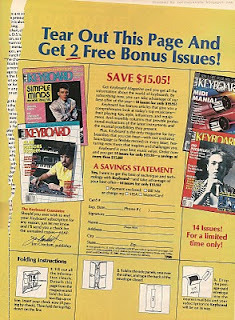 To be fair, during this time period, I believe Sequential had a number of product advertisements constantly running in Keyboard, but it is still quite startling for me to see a manufacturer's ad that doesn't mention their products at all. Sure, it is only a quarter of a page in size, and in black and white, and in the back half of Keyboard. But heck, I appreciate the fact that Sequential put in the time, effort, and $s to create this classy message for Keyboard readers. And I'm also appreciating the holiday time I'm taking right now. Although, for the record, I am at work. Gah! I'd like to extend my own best wishes for a happy holiday season. 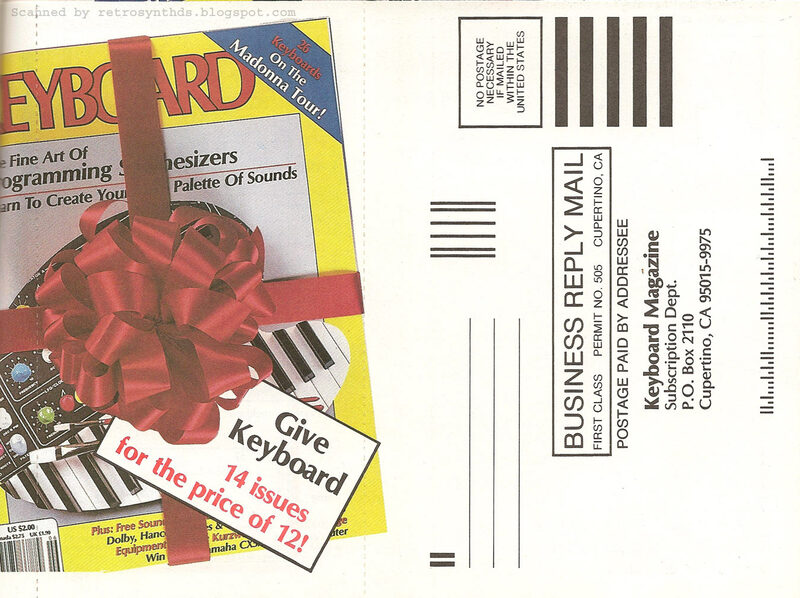 Oberheim holiday-themed family of products advertisement from the back-inside cover of Keyboard Magazine, December 1985. 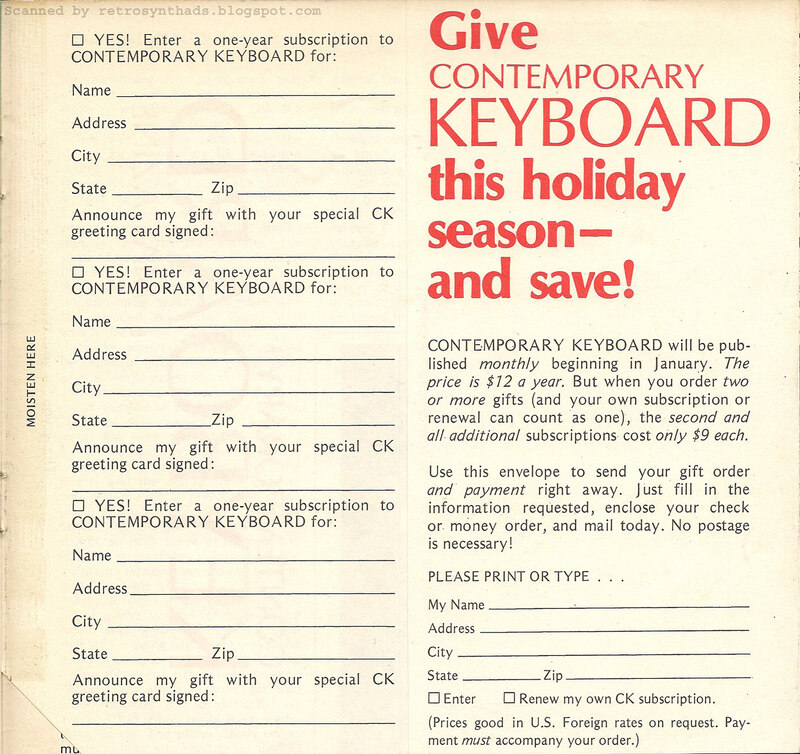 I had mentioned at the end of a recent Keyboard magazine holiday gift subscription blog post, that these season-themed ads were "few and far between". But here is one good example. 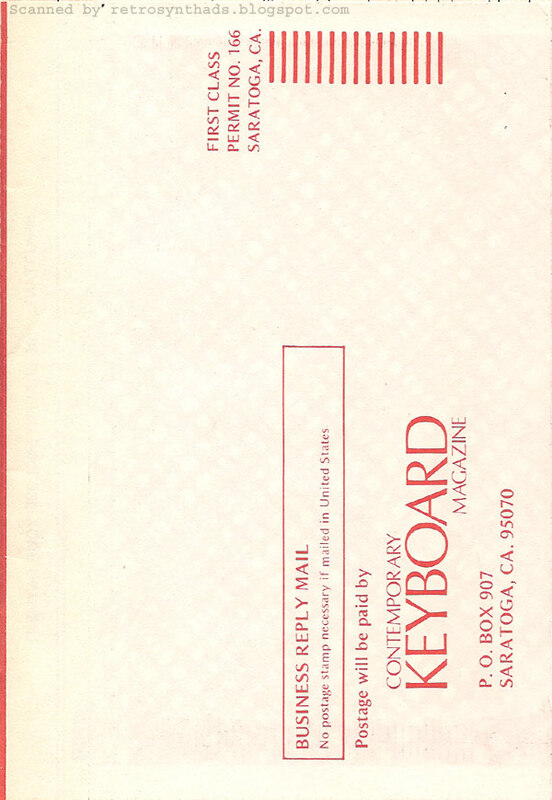 Oberheim had pretty much taken over the back-inside cover of Keyboard Magazine starting in January 1984, and kept that advertising hot-spot well into 1988. Month after month, most of those ads had a very distinctive design- and this illustrated ad definitely didn't follow that style. In fact, that is one of the reasons it stands out so well. 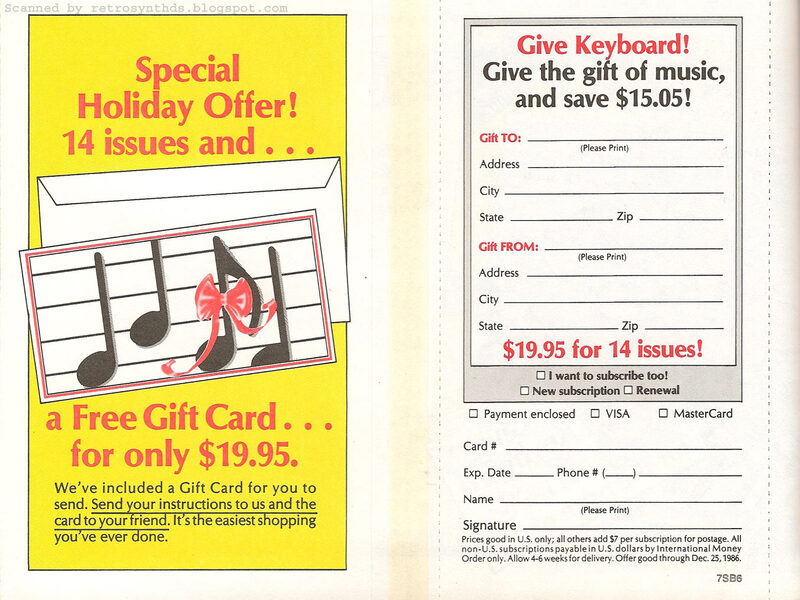 Flipping through the December 1985 issue of Keyboard, I soon realized that it looked like this Oberheim advertisement was the only ad that referenced the holiday season. 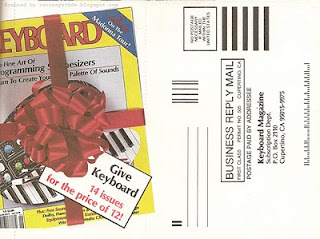 Keyboard Magazine itself had it's usual give-the-gift-of-Keyboard subscription-type ads and forms, but no other manufacturer or service seemed to try and jump on Santa's bandwagon sleigh. 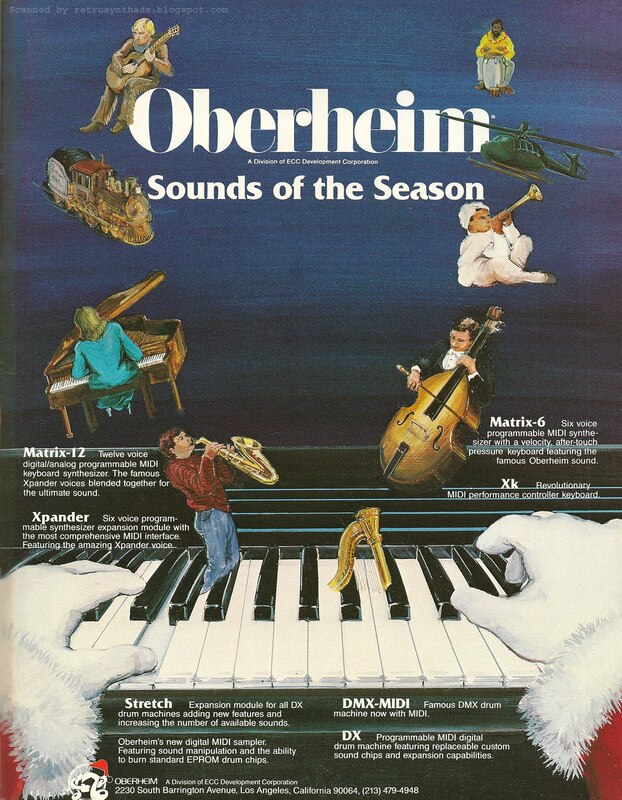 But Oberheim goes full-on, splurging on a colourful illustrated back-inside cover ad that only seemed to have been used once that year. And they do it with a bit of humor too. Under the tag-line "Sounds of the Seasons", You've got cute Santa hands playing a... er... helicopter sounds?!?! As the kids would say - LMFAO. 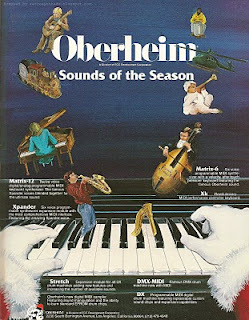 And with all those great Oberheim products available during the 1985 Christmas season, this is one family that I wouldn't mind visiting with during the holidays. 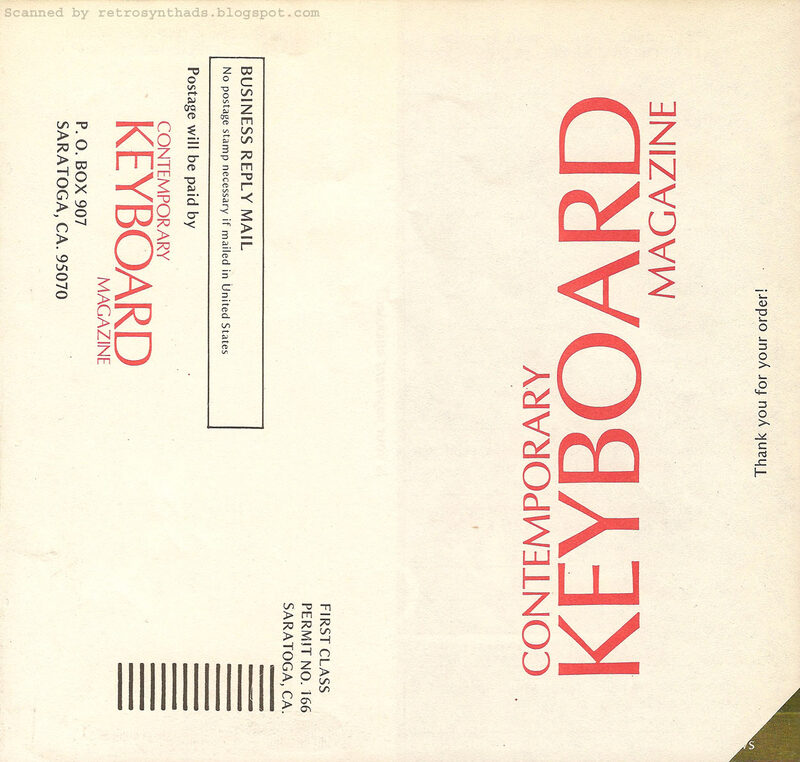 Subscription form attached between the front inside cover and page 3 in Contemporary Keyboard November/December 1975. "I remember when I was a kid..."
Well, it is getting near the end of the year, and I thought I would scan something a little bit different. And this blast from the past shows me just how much I take the Internet for granted. 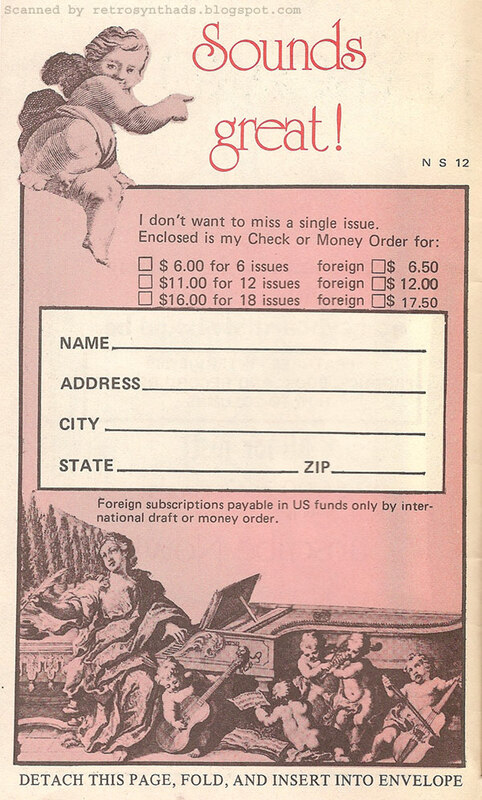 Now'r days, if you want to subscribe to a magazine, you just head over to their Web site, hit that big subscribe button, and charge the sucker to your credit card. I've done it with Keyboard Magazine, Computer Music and many others. But it wasn't always that easy. 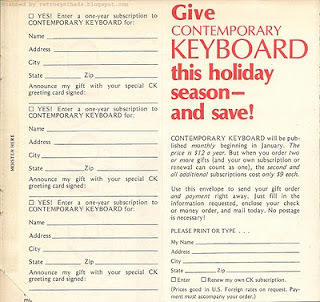 Back in the day when Contemporary Keyboard was first getting started, they needed to get subscriptions up... and fast. But without the Internet around, they had to resort to (*gasp*) snail mail. So like most, if not all magazines, they included a subscription form. 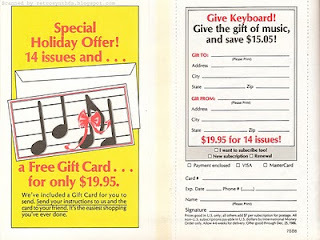 This two-sided subscription form was attached between the front inside cover and page three of the mag. On the front was a nice big promo including details about the mag and the cost - six bucks for six issues (can't beat that!). And, to make sure it was visible, it was printed in a really bright red colour with some crazy imagery. 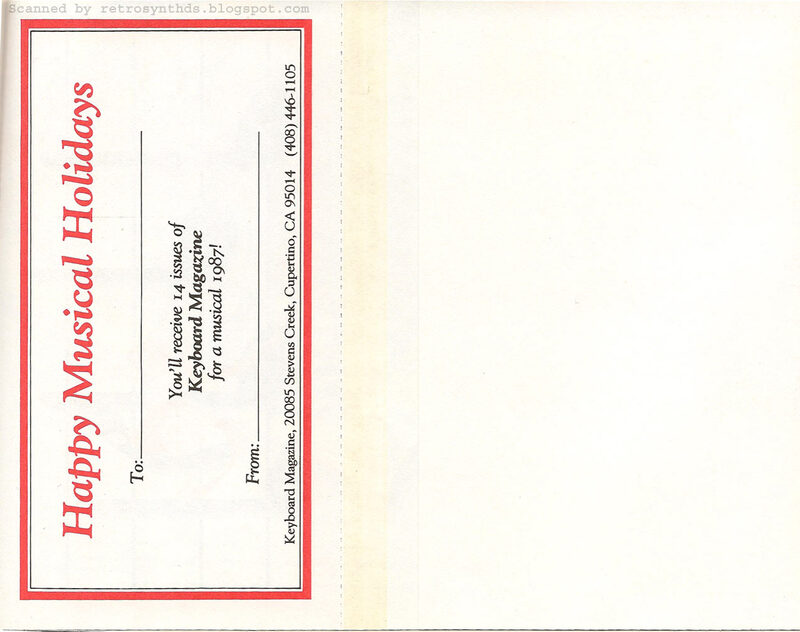 On the back was the actual form, with pricing and address info. You could even save a few bucks by subscribing in multiples of six's. 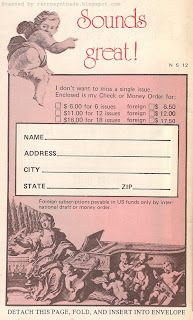 But, the problem was that this subscription form was only about 4 x 6.5 inches (10 x 16.5 cm). So, even in bright red, I guess CK thought it could easily get lost. 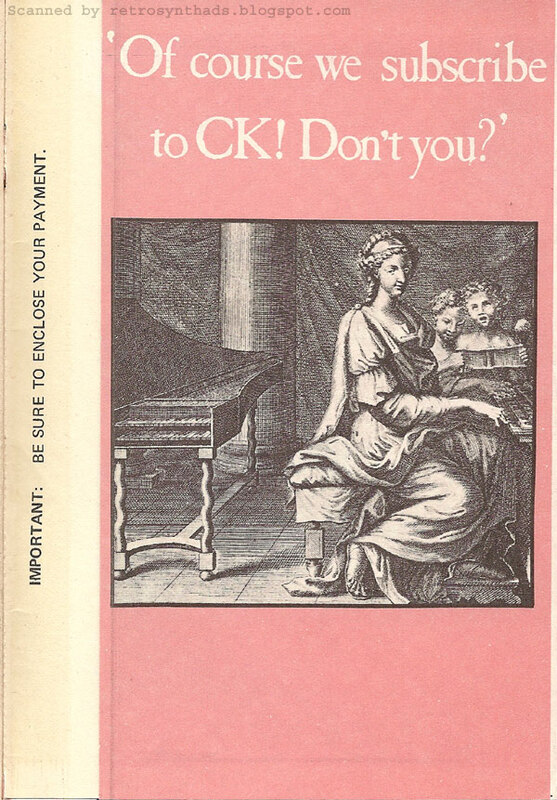 So, to help everyone find this important piece of material, CK also included a big one page subscription ad only a page-flip away on page five, sending the reader back a page flip. And it is on page five that we get a better idea on why this Michelangelo-like imagery was chosen. 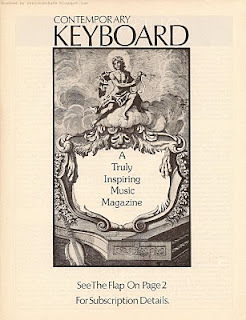 Just look at the tagline - "A Truly Inspiring Music Magazine". So, now that the reader has found the form and filled out a check for the appropriate amount, Contemporary Keyboard again wanted to make sure it was as easy as possible to get that money back to them. So, at the bottom of the back page of the form, you will see the text "Detach this page, fold, and insert into envelope". Well, sure enough, I flipped to the back of the magazine and found that the other half of the form page was attached to a mail-in envelope. Address info already printed on the front, and postage paid. They even kept the 'inspiring' imagery going. So, let me get this straight. A buck an issue. And postage paid? But what a hassle from CK's end. All that design, print and other resources that had to go into this just-starting-out magazine. 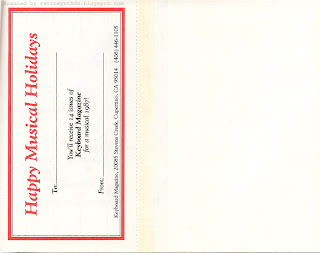 CK kept this form and envelope going until October/November 1976 issue when they changed it to a more contemporary design to promote subscriptions as a holiday gift. Moog Minimoog synthesizer advertisement #2 from page 10 in Contemporary Keyboard September 1979. Moog didn't advertise the Minimoog a lot in CK. Because they didn't have to. 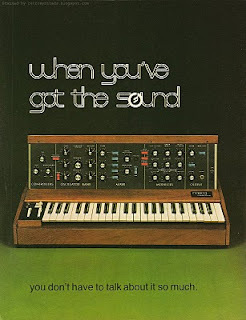 Everybody knew the Minimoog - it was a legend. 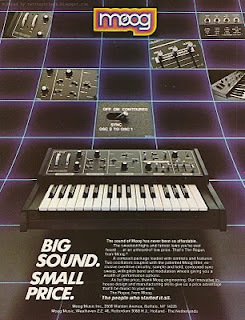 Then, for some reason in mid-1979, Moog decided they needed to up the Mini's profile. Maybe other manufacturers were beginning to get a little to close for comfort, and sales were starting to diminish. Who knows. 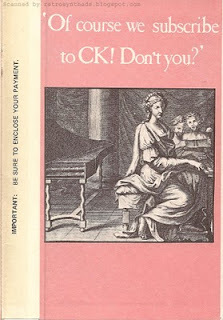 But in the July and August issues of CK, Moog ran a unique and memorable black and white advertisement with the simple ad-title and ad-copy, "You know what this is - because you hear it everywhere". That ad had no logo, no contact info, no anything. But everyone knew that silhouette. 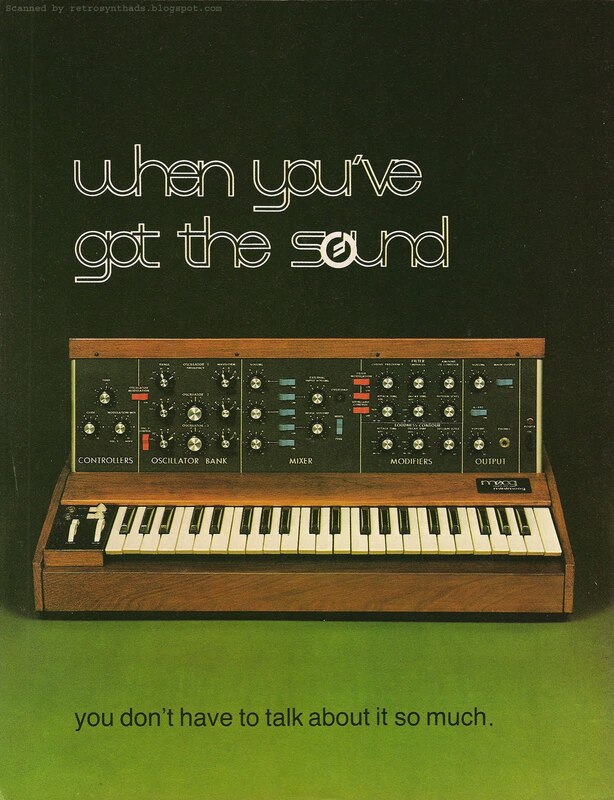 After the ad's two-month run, someone at Moog must have though that they needed to turn the heat up another notch and came out with this baby of an ad. They spun that silhouette around, flipped on the lights, and added more than a dash of colour. But the one thing they didn't add was any more text. Again, they kept the title and ad-copy simple. Readers of CK didn't have to skip a beat. The ad began to immediately run in September and October 1979, and then ran more sporadically in December and the following March. Even with all these unique qualities, to me the most remarkable aspect of this ad is the colour. And in particular, that green. As much as I can recall, green wasn't too common in CK for ads. Blues and reds, sure. But green. Nerp. But in this ad, that green really became instrumental in making that Mini pop. Especially those red and green switches. I even feel it helps pull out the wood grain of the Mini's case. But, now I'm probably just getting too dramatic. Anyways, there isn't much I can say about the Minimoog that hasn't already been said. And, like it says in the ad - with that kind of sound, I don't have to talk about it so much. And I'm not going to try. 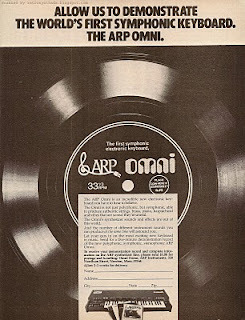 ARP Omni symphonic electronic keyboard advertisement #2 from page 29 in Contemporary Keyboard February 1977. If you read my first Omni ad blog post, you may have noticed I didn't touch on one certain aspect of that ad - the demo sound sheet that was obviously attached to the centerfold between the two pages of the ad. Now I have no choice but to touch on it since ARP was smart enough to keep the demo record promo thing going for the next two months with this single-page advertisement - an ad that showcases a shiny close-up image of the sound sheet. Again - smart move ARP, one month of promotion just wouldn't have cut it. More on that promo record in a second. In that first two-pager post, I really focused on one question - the manufacturing start date of the Omni. 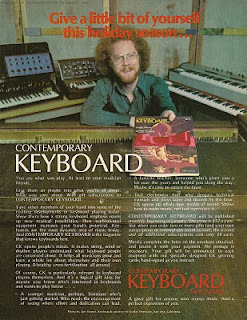 Most online resources, as well as Mark Vail's "Vintage Synthesizers" book have the manufacturing start date of the Omni beginning in 1975. But, based on a lot of evidence, including commentor Micke from my last blog post, I questioned when the Omni really started to be commercially available - and hinted at a much later date. Say, late 1976. "The ARP Omni is an incredible new electronic keyboard you have to hear to believe". "new". That's pretty clear-cut. But there's more. 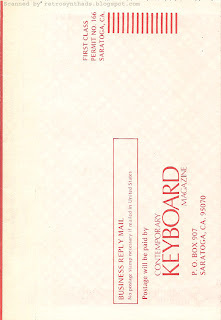 If you look at the small address form that readers could fill out, you will learn that for $1 you can send away "to receive your demonstration record and complete information on the ARP synthesizer line." 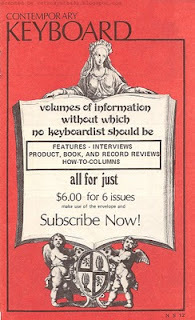 And if you look even more closely at the photo in that form, you will see that at the top of the pile of ARP information (*drool*) is the October 1976 issue of ARPeggio - ARP's newletter. You can barely make it out, but that issue has Less McCann on the front cover with the title "Less McCann 1st to Try New OMNI". 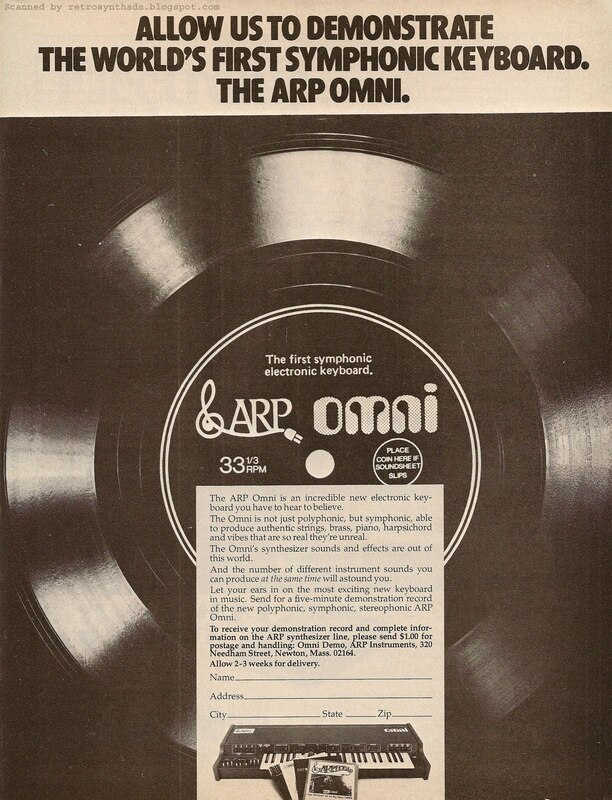 And, if you had a copy of the newsletter, you could flip to page 7 and read the article titled "New ARP Omni: Completely Polyphonic". 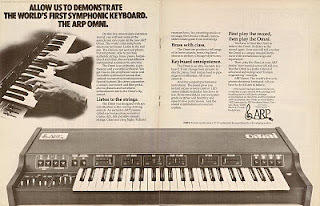 Content of both articles make references to the "new" ARP Omni. And this is the October 1976 issue! Granted - ARP newsletters weren't too frequent, but still... the evidence for a later manufacturing start date just keeps mounting. You can view the full newsletter online - I scanned all the pages and blogged about it back in June. My second-hand copy Contemporary Keyboard didn't include the attached demo sound sheet, but over the years I've manage to pick up a few copies of what I believe is the same one. The Omni demo I have is performed by Tom Piggott, who worked at ARP and was one of the three ARP authors of the book "Learning Music with Synthesizers". It includes examples of all the sounds - violins, violas, string cello, bass, and synthesizer section, many of them played in combination. There is also a comparison of the instruments with the wave form enhancement, chorus/phaser, and stereo effects enabled so the listener can get a really good understanding of just what $2300 or so bucks gets ya. Split and footswitch capabilities are also showcased. I found a copy of the mp3 online at peterunderdog.com's ARP Omni resource page. The "Sounds" section includes the link to this mp3, as well as a link to another Omni demo recording that unfortunately is broken (the link - not the record :o) That Omni site also includes some good tech and repair information, along with links to other ARP-related sites. In my last blog post I linked to two other Web pages that included some other good Omni reference info - but here they are again - Wikipedia and Vintage Synth Explorer. Definitely check those two out if you want to learn more. As I was surfing around looking for more good reference material, I also started to look at more and more photos of Omni's through Google's Image search, and my curiosity turned quickly to the "Waveform Enhancement" switch. Never heard of it before. According to an ARP Omni page on cy-gb.facebook.com, the switch "allowed selection of a square wave voice waveform vs. the default quasi-sawtooth waveform". An ARP Omni service manual (PDF) I found on Synthfool describes the feature as "altering waveforms produced by the Omni to a hollow like (square) sound". "The OMNI's tone generator circuitry consists of a master oscillator at 500 kHz., which drives a large scale integrated circuit top octave divider. The top octave divider produces the highest twelve tones in the instrument. Frequency dividers derive the remaining pitches from the top octave divider. The squarewave outputs of each divider are waveshaped to a sawtooth form (the waveform enhancement alters the waveshape to a differentiated squarewave)." 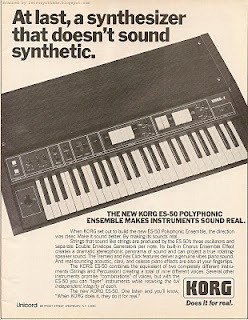 Korg ES-50 Polyphonic Ensemble Advertisement #2 from page 51 in Contemporary Keyboard February 1980. Everywhere I look on the Internet, the ES-50 is almost always referred to as the " Lambda". But the only evidence of" Lambda" in this ad (and the previous ES-50 ad) is in the photo. Look hard enough and you will see a stylized Lambda symbol beside the Korg logo on the right side of the front panel. But that seems to be it. So, I took a look at some online images of the ES-50 to see if there was any evidence of the symbol or name "Lambda" on the back on the unit. The result - nothing as far as I could tell. A recent ES-50 auction I found on MATRIXSYNTH (which, BTW, was what got me interested in researching this keyboard in the first place), included some really good images. But, again no sign of "Lambda". Name or symbol. But then I'm thinking... how about on the manufacturer's serial number label? But MATRIXSYNTH even included a close-up of that label, and again - nothing. Only the ES-50 name can be found in the "MODEL" field. "The ES-50 polyphonic ensemble provides layers of multiple voicings ranging from electric piano, acoustic piano, harpsichord, brass, organ, and strings to human chorus sounds. All voices have separate articulation and are totally intermixable. Three oscillators are used and there is also a variable chorus modulator section. The unit also includes a joystick controller, stereo and mono outputs, variable speed tremolo, ADR controls, split voltage volume pedal input, and interface jacks. 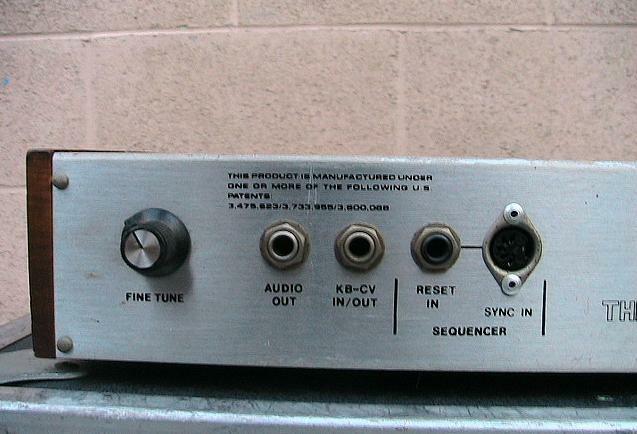 It took a bit more digging on the Web, but I finally found some official evidence that Korg called the ES-50 the "Lambda". Carbon111.com has a fantastic Lambda page that includes some great images, commentary, and reference information including some sounds. But it is Carbon111's link to a PDF of the ES-50's user manual (PDF) that finally provided the proof. 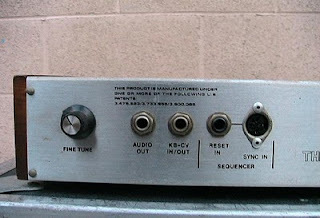 That user manual often included the word "Lambda" after the ES-50 title, or when the stylized Lambda symbol appeared. I find it at least a little amazing that the name "Lambda" could stick around with so little promotion. More power to Korg for that one! So, why name it "Lambda" anyways (besides the fact that they already had come out with a keyboard named "Sigma")? Time to check Wikipedia. Empty set in mathematics. Nope. Subatomic particle. Nope. But cool. A recurring symbol for the human resistance in the Valve computer game series Half-Life. Awesomely cool. But nope. The likelihood that a small body will encounter a planet or a dwarf planet leading to a deflection of a significant magnitude. Ouch. That one hurt my head. The wavelength of any wave, especially in physics, electronics engineering, and mathematics. As for the ES-50 Lambda advertisement itself... after a brief advertising low-point with their Sigma advertisements, Korg, or should I say, Unicord, finally got back on track when they came out with that first black & white ES-50 advertisement. And now, after that initial black and white advertisement ran only once on page 9 (some great real estate! ), they turned the volume up a notch two months later with this colour version of the ad, which ended up running throughout the first half of 1980, and then again near the end of the year. The only downside was that this this far superior ad wasn't placed in the magazine nearly as well, usually running on a page somewhere in the 20s or 30s... except in December when it ran on the back inside cover. I had mentioned in my last ES-50 post that it was really apparent which musician-based audience Unicord was directing that ad towards. And this advertisement zeroed in ever further. First, colour really added some much needed "pop" to this well-framed, balanced ad - in particular bringing out the wood grain finish of to the top of the keyboard. Something I expect most ES-50 users would probably have appreciated. Second, although the ad-copy didn't change much, if at all, the ad really played off of the simple user interface of the ES-50 by replacing the second half of the ad title to, "... and it doesn't take an engineer to play." Third and last, in this new ad, Unicord decided to offer a $1 demo tape to those interested in its sound. Korg ES-50 Lambda Polyphonic Ensemble advertisement from page 9 in Contemporary Keyboard December 1979. What a relief. After reacquainting myself with the Korg Sigma advertisements in my last blog post, I was pretty sure Korg had up-and-fired their old marketing company and decided to start using one of the VP's teen-age kids to do their ads. But, as you can see with this advertisement, Korg's ad agency is back in business! So, why such a difference between the Sigma ads and this new ES-50 ad? 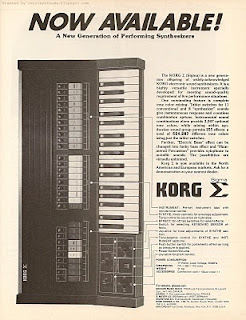 If you look back at those three Sigma ads (ad 1, ad 2, ad 3), you will notice they are distinctly different, not just from the Sigma ads, but from any other Korg ads that ran around the same time period. Ads like those for the MS-10, MS-20, and VC-10 were just so much more creative. Looking closely at all the ads, you will see the answer to this riddle lies in the contact info. In the MS-10, MS-20 and VC-10 ads, and including this advertisement - the only distribution company mentioned was Unicord. But those Sigma ads included a large number of international companies, and in the first two ads, right at the bottom of the list of those companies (but separated by a line) is: "Keio Electronic Laboratory Corp. Tokyo, Japan". 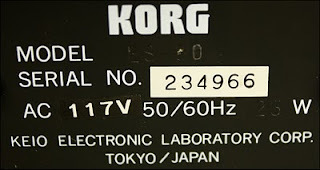 Turns out Keio Electronic Laboratory Corp. is Korg. Side note: According to Korg's Wikipedia page, Keio's "fledgling offices were located near the Keio train line in Tokyo" and Keio can be formed by combining the first letters of the last names of Korg's two founders - Tsutomu Kato and Tadashi Osanai. How great is that! And it gets better: "In 1967, Kato was approached by Fumio Mieda, an engineer who wanted to build keyboards. Impressed with Mieda's enthusiasm, Kato asked him to build a prototype and 18 months later Mieda returned with a programmable organ. 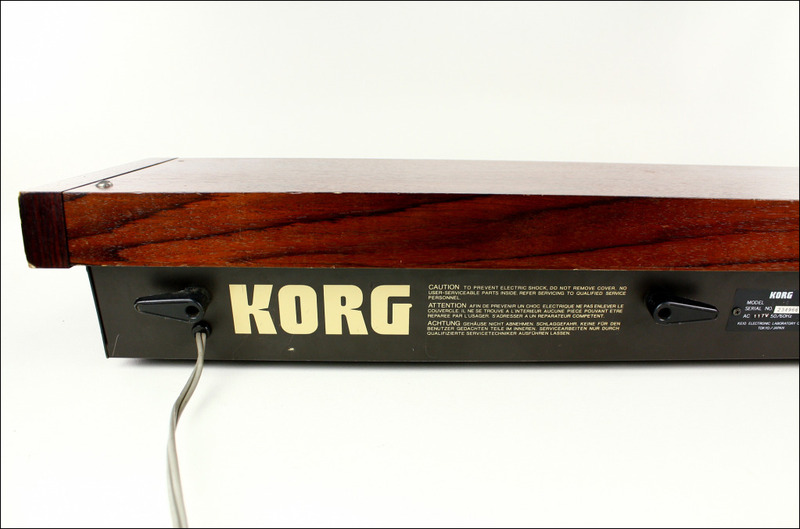 Keio sold the organ under the name KORG, created by using the first letter of each founder's name plus "RG" from their planned emphasis on products targeted for the oRGan market". Sorry, getting a little off-track. Anyways, I'm guessing that Keio (Korg) paid for the Sigma advertisement production and placement costs. 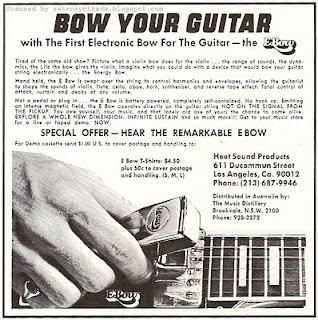 Unlike the other ads, including this one for the ES-50, that were probably created by Unicord's own Marketing peeps (and paid for by Unicord). And a good thing too because I really like this ad when compared to the Sigma ones. The ad title is fun and you know immediately what musician-based audience they were targeting. "At last, a synthesizer that doesn't sound synthetic". The angle of the photo is really nice as well, with a good view of the front panel. But, I have to say, I kinda miss not having the Canadian distribution company on the ad. 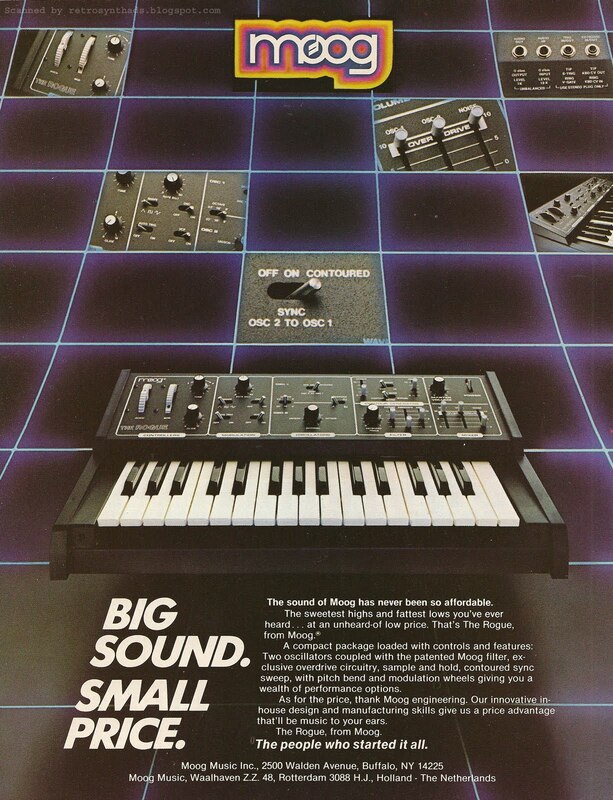 Korg Sigma synthesizer advertisement from page 13 in Contemporary Keyboard August 1979. This was the third Korg Sigma advertisement to come out. And you wouldn't know it just by looking at it, but this was the final ad in the series. 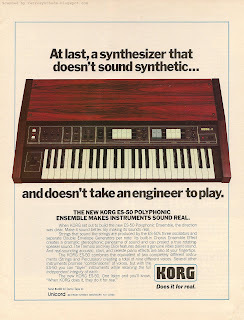 The campaign was actually quite different from most synthesizer introductions at the time, and quite different from the other Korg ads running at the time too. I blogged about the first two ads in the series last February. The first was the pre-launch ad in the June 1979 issue, and as much as I liked the visuals of the ad, I just didn't think Korg put in the same effort for the ad-copy. I also didn't think they let the ad run long enough. In the end, it didn't do it's job. The second ad ran just one month later in the July 1979 issue - and like the first ad, only ran for one month. This one introduced the Sigma to readers as *the* performing synthesizer, where again, the visuals of the ad blew the ad-copy out of the water. 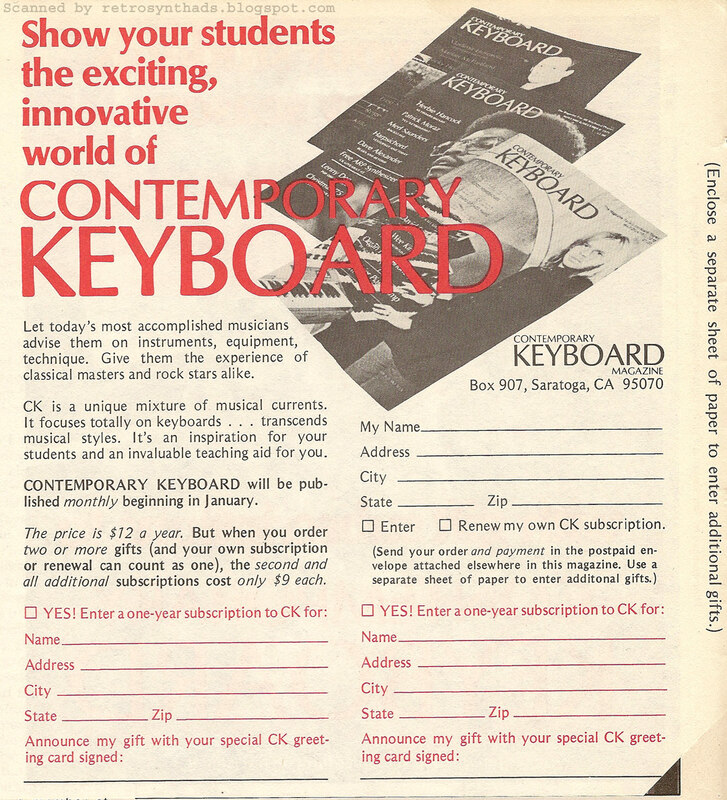 This last ad of the series started running the next month (August 1979), and Korg threw it into the ever-growing rotating list of their products showing up in Contemporary Keyboard at the time. It ran monthly until January 1980. 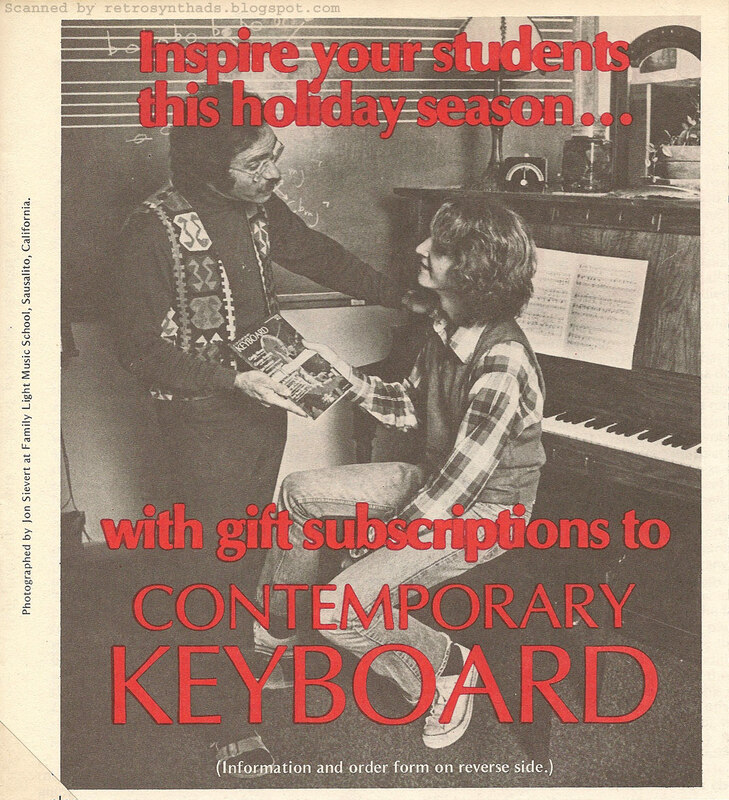 Korg had been really hitting CK readers hard with advertisements starting around November 1978. Before that issue, Korg usually had a single ad per issue, but then in August, September and October 1978, they went silent. Nothing. Nadda. Then in November 1978, Korg started running three ads at the same time - for the MS-10 synthesizer, MS-20 synthesizer, and VC-10 vocoder. 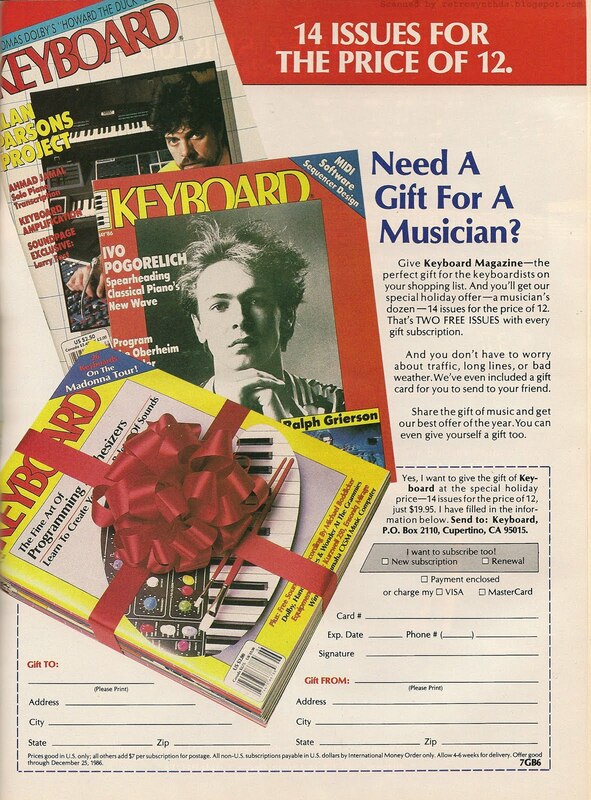 Korg continued to hammer these three full page ads in CK in most issues afterwards, until the Sigma pre-introductory ad was also put into the mix. 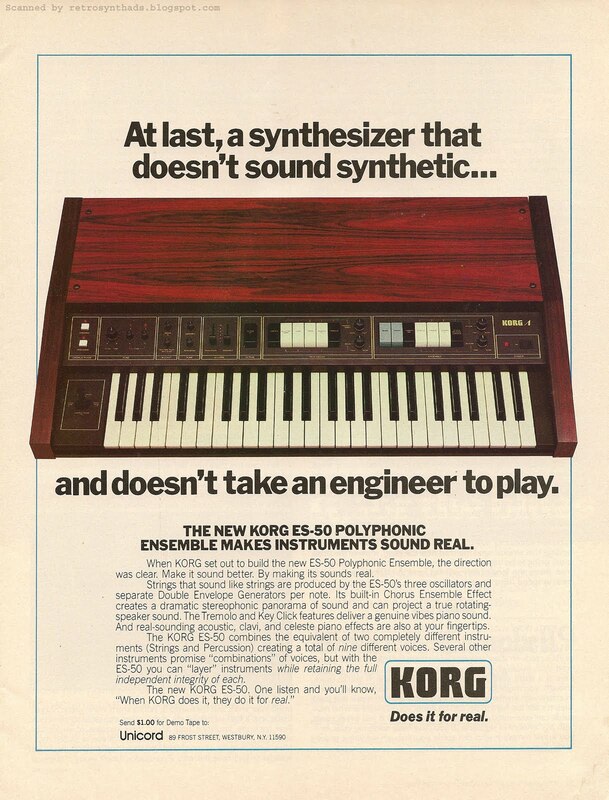 Korg then had *four* full page ads running for at least the two summer months, until the VC-10 ad was phased out. I'll have to take a closer look, but off the top of my head I can't think of any other companies during this time period that had that many ads in a single issue. Not Moog. Not Oberheim. Not Roland. 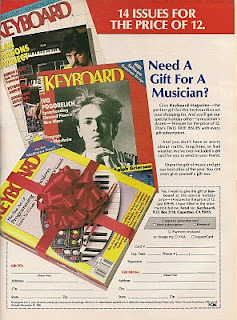 As I mentioned in a previous Sigma post, "a reader is either going to remember all four ads because they are a Korg-fanatic, or more likely, all that Korgmania is just going to get lost in a sea of gearporn". As far as this ad is concerned, the ad-copy has the same "feel" as the first two ads with the addition of a bit more reference information. Plus, below the ad-copy is a list of bullets that include information on each of the main sections of the synthesizer in the photo. Unlike the first two ads, the photo in this ad is purely functional. Together with the section bullets, the photo provides the reader a good overview of what the Sigma has to offer. I finally had a chance to play on a Sigma for an extended period of time just a few weeks back - which is what got me thinking of this third Sigma ad. Overall, I wasn't as impressed as I thought I would be with the sound. Maybe I had built the Sigma up in my mind a little too much - what with those two joysticks and all that. But, in the end, I guess I'm not as interested in the performance side of this synth as I thought I would be. Moog wasn't just selling a synthesizer with the Source, it was selling "the future". Just look at that big photo showcasing the silver casing, front panel 1980's colour-scheme, and slick membrane buttons. But maybe slick isn't the right word. The Moog Source was the first (and last) Moog synth to use membrane-type buttons, but from what I understand they were just a little more reliable than the buttons on my Roland JX-8p, and a little less than the ones on my Matrix-6r. 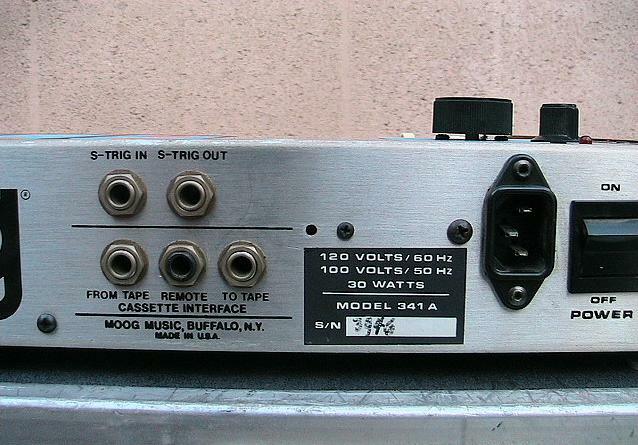 The size and placement of the back panel photo tells us a lot about how Moog was positioning the Source in the marketplace. Back panel photos are often large, and included in an ad so that readers can see all the cool in's and out's. But the small back panel photo in this ad is pretty much useless, and the placement of the photo makes it look more like an after-thought. It's like it was thrown into the ad just because "it's always been done that way". In fact, the small photo is literally pushed aside for what Moog was really trying to sell - the power of digital technology. And all that digital power can be found in the much larger, centred, vertical photo of Moog's "programmed memory chip" and the accompanying Z80 microprocessor. The Z80's Wikipedia page actually devotes a whole section to its integration in musical instruments under "Notible uses". I didn't realize the number of popular synthesizers that used the Z80 for one thing or another. Gear from Akai, Emu, Lexicon, Moog, Oberheim, Roland, SCI, and Waldorf are listed. 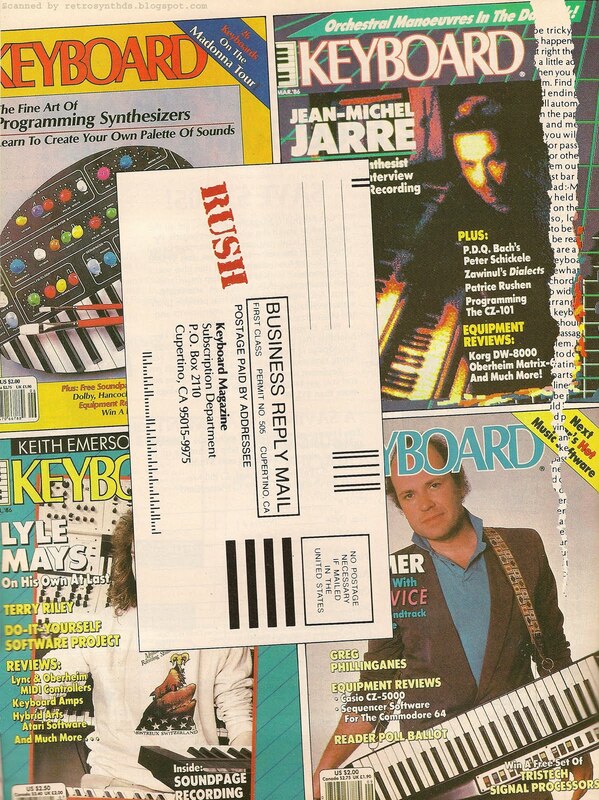 Ironically, the only synthesizer that stands out as not being mentioned (on the date of the writing this blog post) seems to be the Source - and it was the one pushing the microprocessor right on the ad! Anyways, the whole Wikipedia article is actually quite an interesting historical read. I recommend it. The ad-copy of the ad reinforces everything a reader takes in visually through the design. First, unlike this Rogue ad, there is no misunderstanding what synthesizer the reader is looking at. The title "The Source" shows up twice in two different large fonts. And, to make sure Moog got the whole microprocessor-thing across to readers, peppered throughout the ad-copy are words like "digital", "program", and "programmable". This was, after all, the first Moog synthesizer to offer patch storage. But Moog wasn't dumb - they didn't let years of tradition get totally lost in a sea of one's and zero's. 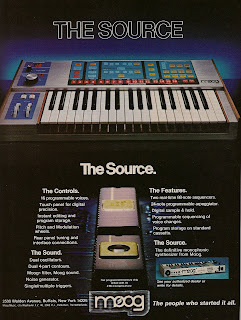 They make it perfectly clear to all potential buyers under "The Sound" section of the ad: "Moog filter, Moog sound". "Moog Source Synthesizer. The Source is a microprocessor-controlled programmable monophonic synthesizer. It has a three-octave keyboard, two VCOs, and a noise source. The oscillator's range is from 32' to 1'. They can produce sawtooth, triangle and variable pulse waveforms, and can be synced together. The two four-stage envelope generators are micro-processor-generated and control the VCF and VCA. The oscillators and filter can be controlled by an LFO which puts out triangle and square waves. Modulation and pitch wheels are included. The unit will remember up to 16 patches, and it comes with a cassette interface built-in so the total number of patches that can be stored is virtually unlimited. The front panel controls are touch switches. When one is pressed it is assigned to the incremental control at the left of the keyboard. This pot and LED readout then give you a numerical readout of the value that the switch you hit is set at. You can adjust this value as you like. There is also a software-generated sequencer (two real-time-loaded sequences of up to 64 notes each), an arpeggiator, automatic triggering, and sample-and-hold. Moog. 2500 Walden Ave., Buffalo, NY 14225." As much as I love all the futuristic aspects of this synthesizer, there is one thing in particular that really got my attention with this synthesizer. Unfortunately, this blog post is already kinda long, so I'm going to save that for part 2. Moog Ten Band Graphic Equalizer and Three Band Parametric Equalizer from page 9 in Contemporary Keyboard Magazine April 1978. 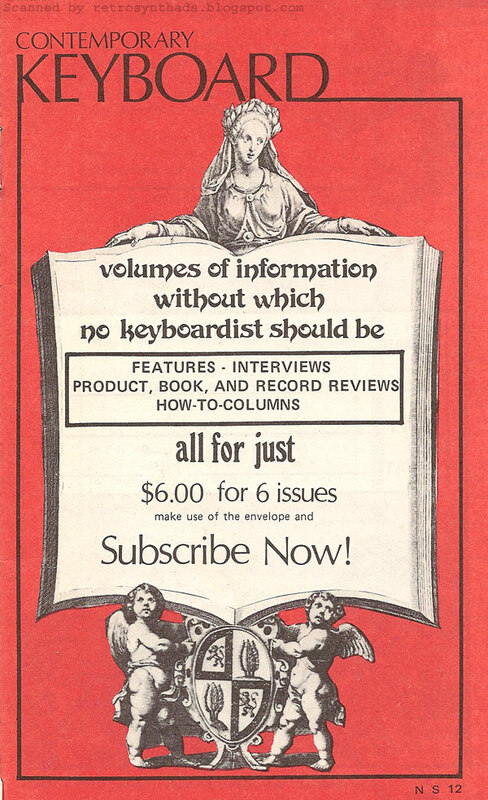 This ad popped up in Contemporary Keyboard in April 1978. and continued to run in the following two issues. Then it ran again in September 1978. 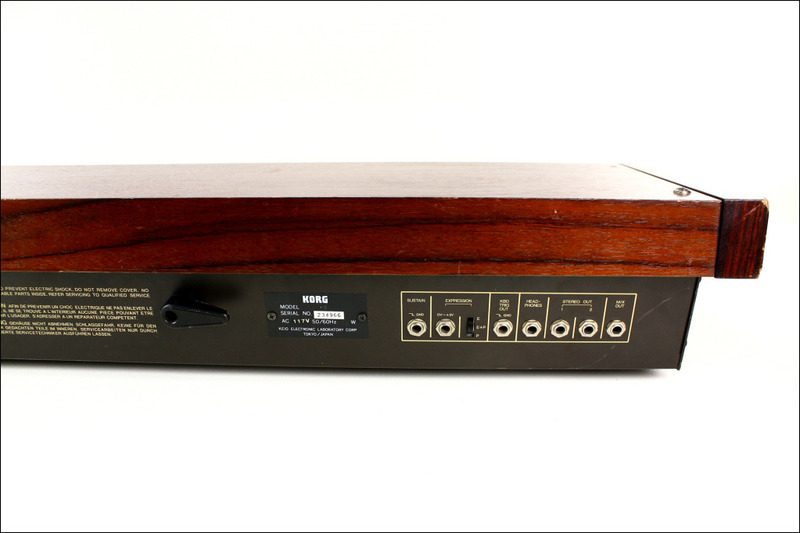 The two equalizers were also featured as CK Giveaway #25 in the April 1978 issue ($600 value!). Normally I'm not much into vintage signal processors and effects gear, but the first time I really paid attention to this ad, it kinda felt 'weird' to me for some reason. For the first few minutes I couldn't put my finger on it, but then it suddenly hit me in my marketing-type head. The weirdness had nothing to do with the technology side of things. 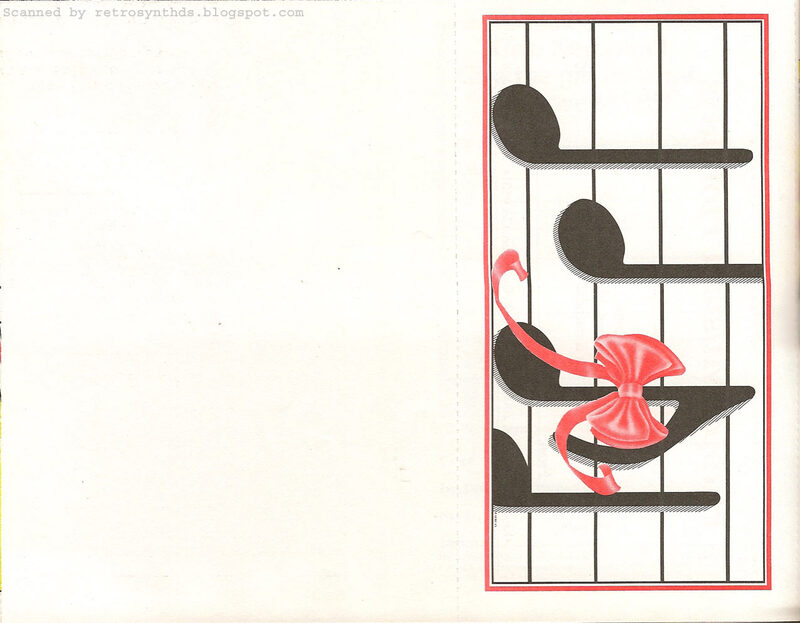 Or even the design of the ad (although you will notice that the descriptions beside each instrument should have been switched around). No, the thing that bugged me was the fact that neither of these units had a "cool" name. They had model numbers on the back that are often included in online descriptions, but that's just not the same as a cool name that appears on the front panel. And the ad just refers to them as 'Moog Graphic Equalizer" and "Moog Parametric Equalizer". Moog had a good thing going with their x-moog naming convention around this time period. MiniMoog. MicroMoog. PolyMoog. Minitmoog. Multimoog. You get the idea. Not the most creative, but still, they were descriptive terms and the names just "worked". Because I'm not really into vintage effects, I decided to flip through a few issues of CK from the same time period just to see what other effects companies were doing in terms of naming conventions. MXR had their Phase 45, Phase 90, and Phase 100 phase shifter pedals. Horner had their Vari-Phaser phase shifter. And Polyfusion had their stereo panner SP-1. All decent enough - but nothing spectacular. And it gets worse. MXR also had a digital delay named the "Digital Delay", And Ross had their digital delay named "Stereo Delay". Booo. It's not to say there weren't some goodies out there at the time. In fact, what I think was one of the most progressive effects names at the time turned up in an October 1977 CK Spec Sheet promo - the Electro-Harmonix Memory Man Deluxe analog delay. Electro-Harmonix *still* sells a Memory Man Deluxe delay that uses the same font and very similar graphics and controls that they used back in 1978. Nice. 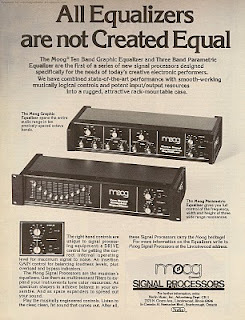 "Moog parametric and graphic equalizers. The Moog three-band parametric equalizer has a range that is adjustable from 4 octaves to 1/4 octave on all three filters. The maximum available cut/boost on the 4-octave width is +-12dB; on the 1/4-octave width it is +-20dB. Nominal input level over 30 to 15,0000Hz is +4dBm. The overall frequency response with the effect switched in is 30 to 15,000Hz. A status switch controls whether the parametric is in the circuit or not, and an indicator light goes on when the effect is engaged. Power requirements are 100 to 135 volts AC @ 60Hz or 200 to 270 volts AC @ 50Hz, selectable from the rear panel switch. The ten-band graphic equalizer's overall frequency response is 30 to 15,000Hz +-2dB. Maximum available cut and boost on each band is +-15dB, and the insertion gain is adjustable from -10 to +10dB. The unit has nine band-pass filters spaced one octave apart from 31Hz to 8kHz and a shelf-type filter at 16kHz. Like the parametric equalizer, the graphic has a status indicator light that lets the performer know when the effect is in the circuit. Power requirements are the same as those for the parametric. Moog Music, 7373 N. Cicero Ave., Lincolnwood, IL 60646." Doing this research has given me more appreciation for vintage effects, and has definitely made me more interested in getting more involved in both vintage and current effects gear. I have to confess I do usually have a Boss OS-2 Overdrive/Distortion pedal attached to my 303 (along with a Boss NS-2 Noise Suppressor :o) And I have been doing more effects-based experimental-type stuff lately. I'm no where near the point where I can get full-on Chris Carter in my studio, although it is something definitely to strive for. Definitely hit "play" on that video I've linked to. Moog Rogue synthesizer advertisement from page 15 in Keyboard Magazine, November 1981. Overdrive? Well, that sounds interesting! This black and white 1/2-pager was the first ad for the Moog Rogue, running in Keyboard during the latter half of 1981 and again at the beginning of 1982. It was then replaced by the much more colourful, full page Moog Rogue advertisement that ran sporadically from 1982 to 1984. This humorous car-racing themed ad ("sorry, air conditioning and racing stripes unavailable") heavily promoted one of the main features that Moog must have thought would set this synthesizer apart from the pack - OVERDRIVE. 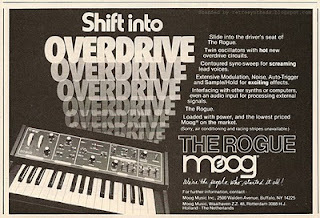 "Overdrive" is not only featured prominently in the opening tag-line of this well-designed advertisement ("Shift into OVERDRIVE, OVERDRIVE, OVERDRIVE, OVERDRIVE..."), it is also the first feature to be mentioned in the ad-copy: "Twin oscillators with hot new overdrive circuits". So, what was so special about the overdrive? According to Stuart M Condé, a self-described "creative, and somewhat opinionated sporty animal loving extrovert" (great bio! ), it's the main reason he loves his Rogue so much. Stuart created a Moog Rogue page on hubpages.com, and explains that it's a great way to get "nasty over-driven 'hoover' type sounds, or a deep warm bass". Just "whack it up and it saturates the filter to produce a distinctively rich sound which is perfect for bass or screaming lead sounds. It's not quite as appealing as the overdrive circuit on the Mini-Moog but it still sounds wonderfully organic." Interestingly, what Moog thought would be such a great feature to promote, and what is now known as such a great feature of the Rogue, seemed at the time to... well... get a little ignored by everyone else. Or at least, that is how it looks to me. For example, the overdrive function received only a few sentences in the "Mixer and Final Output Controls" section of Dominic Milano's dual Sequential Pro-One/Moog Rogue Keyboard Report that came out in January 1982. "The mixer has an interesting feature - you go into an overdrive mode when you get to about 5 on a scale of 1-10. This gives you some warm and fat intermodulation and harmonic distortion. It adds some bite to the sound of the unit." In Dominic's defense, I guess he is indirectly referring to the overdrive in the introduction of the report by remarking that the "Rogue is a useful tool in creating nice-sounding lead lines". And again at the end of the Rogue section of the report where he states that "it's pretty good at lead lines". 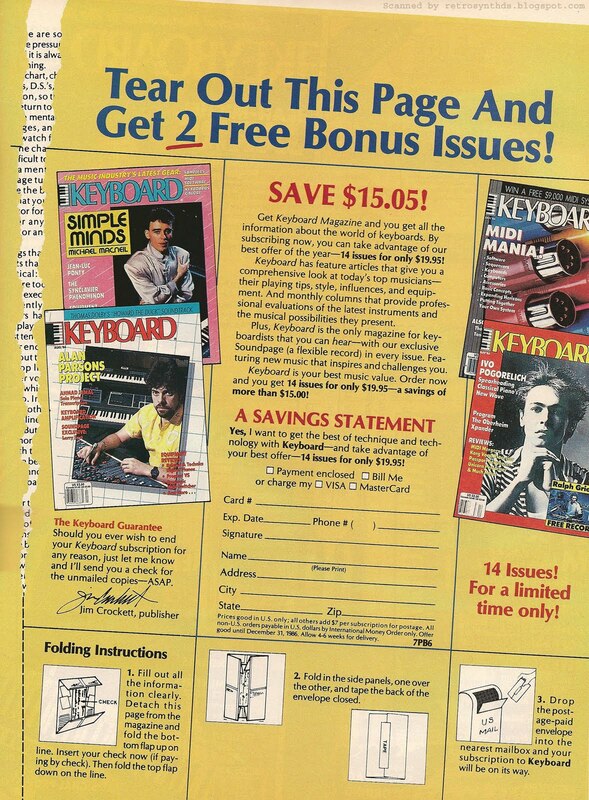 But, if Moog thought the overdrive feature would be such a hit that they based their whole advertisement theme around it, you would think it would have been mentioned as being directly responsible for the sound in review articles such as this Keyboard Report. So, is that Keyboard Report indicative of how the Rogue's overdrive feature was received by the synthesizer community at the time? Did Moog over-estimate how well the overdrive feature would be received, and respond by later changing it's marketing strategy for the Rogue? This certainly would seem to be the case when you compare this ad to it's replacement. The overdrive functionality that Moog positioned so prominently in this advertisement was virtually lost in the follow-up full-page Rogue ad. Look at that ad and you will see that "overdrive" gets just a small mention in the ad-copy and a small photo-op in the top right-hand corner. Instead, Moog focuses on one of the Rogue's other unique qualities - Moog sound at a small price. I can't tell you if Moog's reason for shifting their marketing strategy was due to the synth community's lack-luster response to the overdrive feature, or if it was just a Moog marketing guy's whim that led to the change. But something happened to make them change gears (pun intended). Or, am I over-thinking it [again]? Maybe Moog was just expanding on the original theme of "overdrive" to a more generic "Moog sound" at a more affordable price. The overdrive is, after all, one of the main features of the Minimoog sound. Maybe it wasn't such a jump to go from one to another. Meh. I do know that if you look around the Web today, the Rogue is still known for being a cheap way to get that Moog sound we all so love. So, in the end, Moog probably made the right decision. And, in the end, Moog still seemed to be selling Rogues well into 1984. End note: BTW - you can read more about the Pro-One/Rogue comparison report in the second half of my rather long-winded Pro-One clear-plexiglass blog post. 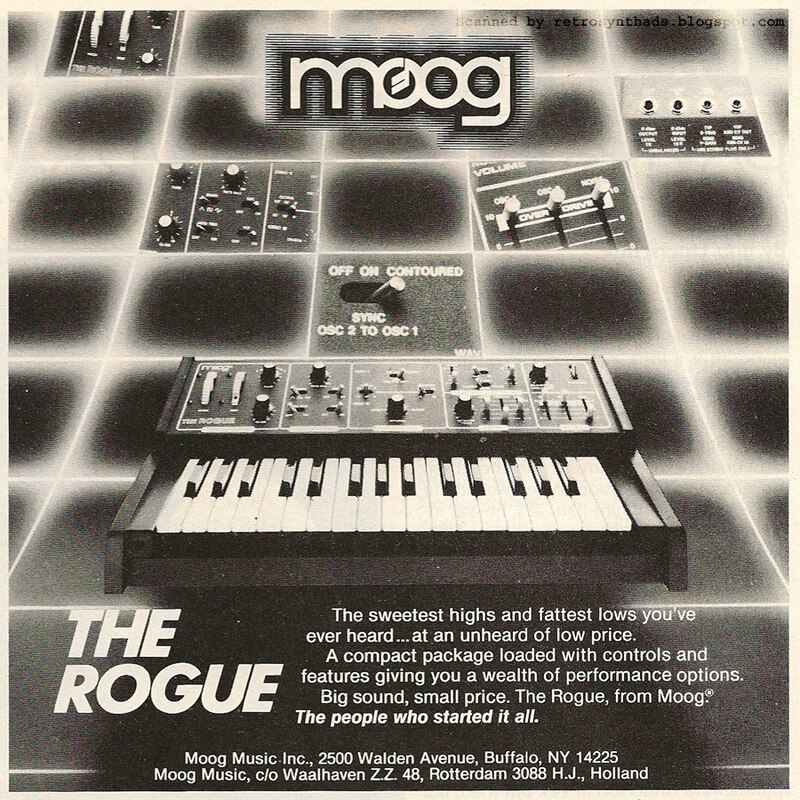 Moog Rogue advertisement from page 39 in Keyboard Magazine, June 1982. 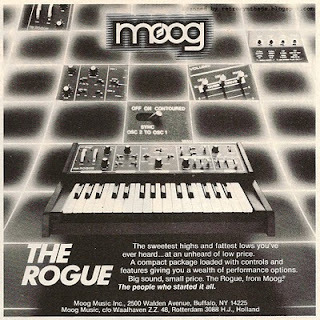 I was flipping through Keyboard yesterday when I came across this Moog Rogue ad. It wasn't the first Rogue ad to appear in Keyboard Magazine, but it is the one that I always remember when I think of the Moog Rogue. And my first thought was, "Hey - MoogFest was just on, what a great way for me to contribute in my own little way". But as great as MoogFest was (and I'm jealous as heck that I couldn't make it), there were two other memories that flooded back into my brain when I started looking more closely at this ad that clinched it for my blog post. And, surprisingly only one of them was synth-related. The Moog logo immediately brought back my first memories of using Photoshop's "stroke" feature. I used that "stroke" feature a lot on band posters a long while back. The Moog logo really would have gotten lost in this ad if they hadn't put those ever-expanding blue, pink, orange and yellow stroke lines around it. The grid line graphic elements making up the backdrop of this ad immediately brings me back to memories of watching the movie Tron, which, probably not-so-coincidentally, came out the same summer as this ad. I wonder just how much TRON's computer-generated glowing blue design influenced the art and culture of the time. I'm guessing *a lot*. But that's not the synth-related bit. You can find some great historical information about the original TRON soundtrack on her Web site, including her TRON anthem 'first sketch' and some great anecdotes. 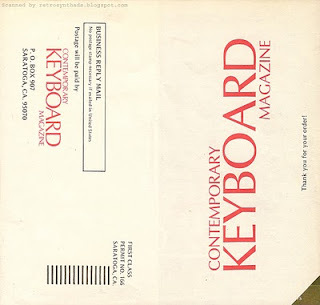 There is also a PDF link to a Keyboard article written by Bob Moog entitled "Wendy Carlos & Michael Fremer reveal the secrets behind the soundtrack of TRON". An excellent read. A few quick Google searches will provide even more great info. To me, the original TRON movie was all about the visuals and the soundtrack. And I expect no less from this new movie. I'm crossing my fingers this movie lives up to the hype I've built up in my tiny little brain. So, those two great memories definitely influence my opinion of the ad. And I do love this ad. Honestly, I can only think of one thing about this ad that bugs me. You have to look *really* hard for the actual name of the synthesizer - The Rogue. 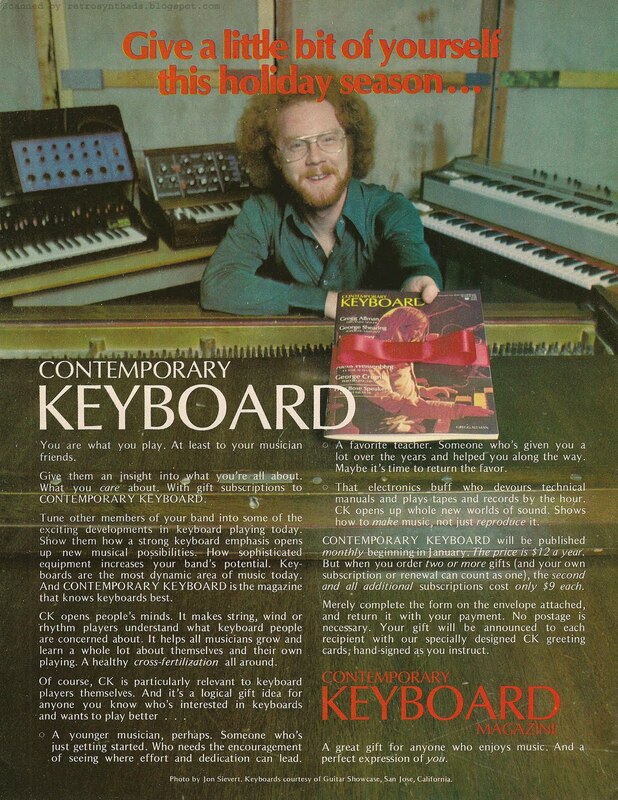 The logo can be seen in the photo in the top-left corner, and on the photo of the synth itself. But both of those are rather small. And it's not until you get to the end of the third line of ad-copy that you see the name. If you look around the Web, the Rogue often gets a date of "1981" stamped on it. But, this Rogue ad actually appeared very sporadically throughout 1982 (June, September), 1983 (November), and, yes.... even 1984 (March). 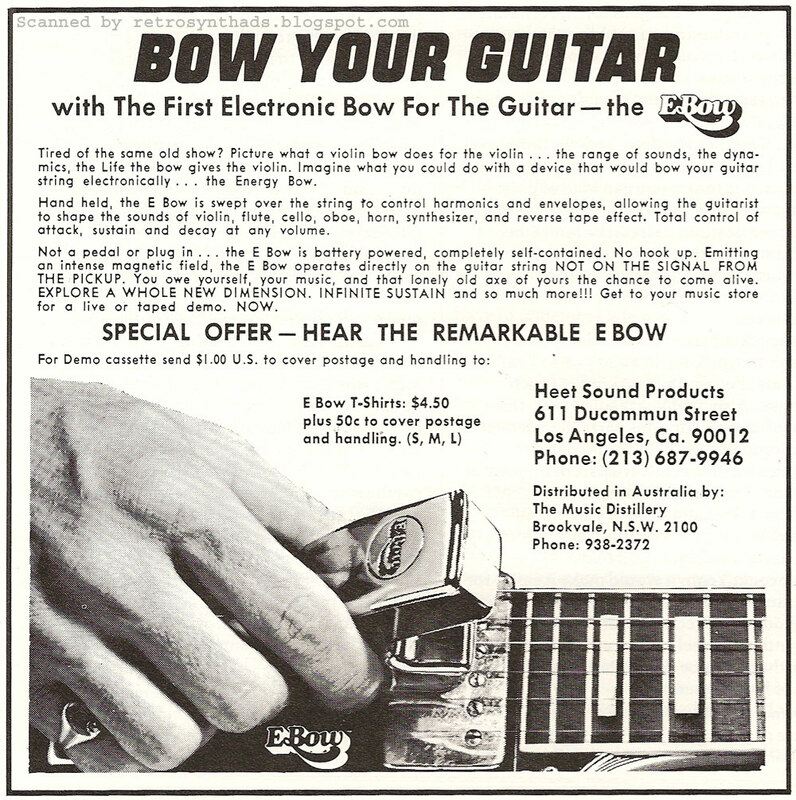 The only difference between the 1982 version of the ad and the later versions is a call-out box in the top right corner that reads, "Now, surprisingly affordable, visit your dealer". Which is strange, because the first line of the original ad copy included the text, "never been so affordable". In fact, two-thirds of the ad-copy is devoted to telling the reader how affordable this synthesizer is. I guess they were making sure they hit *that* nail on the head. 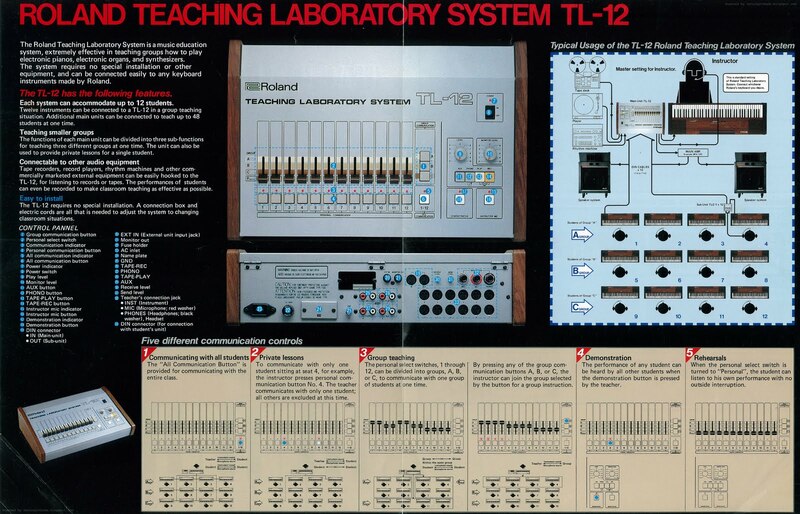 Roland TL-12 Teaching Laboratory System brochure from May 1986. Here's something a little bit different. The TL-12 Teaching Laboratory System was part of Roland's effort to get more of their technology into the music education classroom. Just look at all those DIN cable connectors sticking out of the back of that thing. That's just *hot*. When I first saw them all, I immediately started getting ideas in my head about how I could possibly take advantage of the the TL-12 to sync all my old Roland gear together. I thought to myself, "Did other people know about this thing? 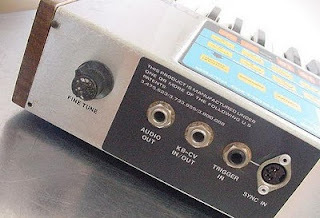 Or did I just discover a way to by-pass the need for six Korg KMS-30 MIDI-DIN sync boxes?!?!". More about that in a bit. First, a little reminiscing and reference info. If I recall correctly, I remember a long while back hanging out in a mall somewhere in town and there was this music store that gave group music lessons. And anytime I wandered passed this store, I would see a group of students through a sliding window/door using electronic keyboards and headphones. I can still see all the cables running from the student stations up to the teacher's small platform. So, ever since I came across this brochure, I think back to that group of students and can't help but think (and hope :o) that this was what they were using. "The TL-12 is designed for instructing students how to play electronic pianos, organs, synthesizers, and any other electronic instruments. 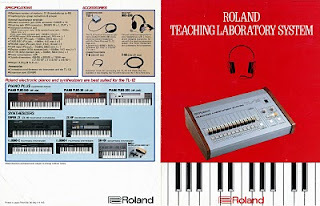 The basic system requires no special installation or other equipment, and can be connected easily to any keyboard instrument made by Roland as well as most other brands of keyboards. The unit can accommodate up to 12 students. Additional main units can be connected to teach up to 48 students at one time. The device can be divided intro three subgroups allowing the teacher to monitor any group at the push of a button. With the addition of of a connecting box (Model TLC-1) and a headset/microphone (Model RHS-100) to each keyboard in the class, the teacher can talk to everyone in the class, to a preselected group, or to an individual student. The device also lets one student demonstrate for the entire class by pushing a demonstration button. The private and group selector functions allow the remainder of the class to continue to rehearse without hearing every communication between teacher and student. Tape recorders, record layers, rhythm machines, nd other external equipment can be easily hooked up to the TL-12. Performances by students can even be recorded and played back through the system. Measurements are 18" wide, 4-1/2" high, 11-3/4" deep, and weight is 9-1/2 lbs. Price is $695.00 for the TL-12; the TCL-1 connecting box is $20.00; and the RHS-100 headset/microphone is $60.00. Also offered are system packages including all connections, headsets, and cords for classes of 12 (priced at $1,850.00) and classes of 6 (priced at $1,295.00). Roland, 7200 Dominion Circle, Los Angeles, CA 90040." This brochure is also awesome for a number of other reasons. Flip it open and the first thing your eye hits are the photo images of the front and back of the TL-12. Next, your eye is drawn to the "Typical Usage" diagram with that cool looking instructor guy with the headset. And finally, you get to the "Five different communication methods" diagrams. These alone provide some really valuable information for an educator thinking of slamming down over a thousand dollars for a full-fledged system, as well as some really cool reference information for someone in the future like me. But, I find that there is a real disconnect between the front of the brochure and the rest of the info. Seriously - that fire engine red front cover design looks like it is straight from the 50's. The title font, the headset image (which I may have to swipe for a design project I'm working on right now... talent borrows, genius steals, suckas!) and even the photo of the unit itself all look really dated. 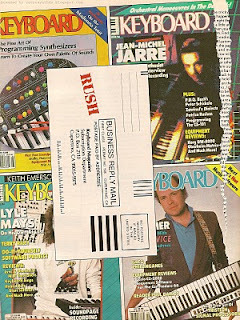 In 1986, it would have been really hard for me to pick up that brochure if it was sitting at a music store. But then again, maybe I wouldn't have been the intended audience. And finally, on the back page, you see some specs, accessory info, and most awesome, photos of Roland gear "best suited" for use with the TL-12. Really? SH-101? It would be awesome to see 12 students learning monophonic synthesis on SH-101s using this system. In fact, I think I had a dream along those lines last night. 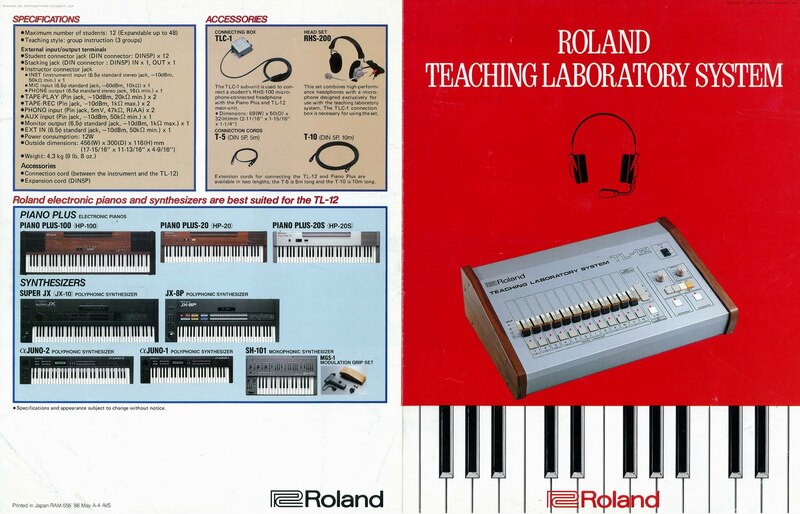 If you are still reading, you will recall that at the beginning of the post I mentioned that when I first saw the TL-12 brochure, my first thought was using it as a way to DIN-sync a wack of Roland gear together. The unit has 12 DIN connectors, right? And the diagram shows a drum machine plugged in - that could easily be the master sync, right? And the brochure does say "Din connector (for connection with student's unit)" - right? RIGHT? 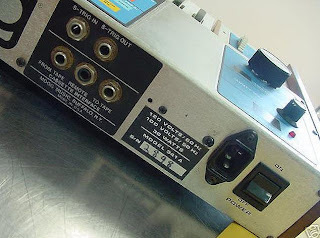 Turns out Roland used DIN cables for a lot of different purposes, and it looks like in the TL-12's case, the DIN connectors are purely for audio. The TLC-1 connector box that would be located near each student's station is the real key to getting all the different audio signals to and from the TL-12. The AUDIO out of each student's keyboard instrument plugs into the TLC-1 connecting box, as does each student's headset PHONES and MIC plugs. Then, the DIN cable is used to carry all that audio to and from the TLC-1 through each of the 12 DIN connectors on the TL-12. But even if the TL-12 wasn't meant for carrying/splitting DIN-sync signals, could it still be used for DIN-sync purpose? Could you have one of the 12 pairs set up to be master through the 'demonstration' button, and push the sync signal to the other 11 connectors? It would require that the same DIN cable pin/wires used for carrying sync signals be the same ones Roland used to carry these audio signals. And wouldn't it be great to use the separate group and solo features to split DIN-sync signals at different points in a song?